What Canadian baseball fan can forget the 1993 World Series? This past Saturday was the 17th anniversary of one of, if not THE, most exciting sports moments in the history of Canada – Joe Carter’s walk-off home run that won the 1993 World Series for the Toronto Blue Jays. I will never, ever forget Joe’s moment. His single swing of the bat made the Jays back-to-back world champions. That’s something only a handful of MLB teams have done before or since. It was a magical time for me and all Canadian baseball fans. To reach their second World Series, the Jays had defeated the Chicago White Sox in the ALCS. The ALDS didn’t exist yet. And Toronto was essentially the same ball club that had won it all in 1992. 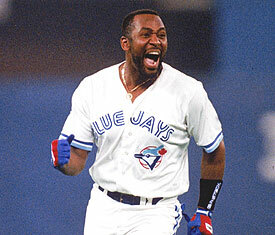 CF Devon White, 2b Robbie Alomar, RF Joe Carter, 1b John Olerud and C Pat Borders were all back to help Toronto repeat. LF Rickey Henderson, DH Paul Molitor, SS Tony Fernandez and 3b Ed Sprague were all in the Jays’ starting World Series line-up for the first time. Juan Guzman, Dave Stewart, Pat Hentgen and Todd Stottlemyre were the Jays’ four starters. Duane Ward had replaced Tom Henke as the Jays’ closer. And Toronto was poised for another big baseball celebration. But, as Game One began at SkyDome, it was necessary to take my wife to the hospital. As I recall, Phillies’ tough guy Lenny Dykstra began the game with a walk off Guzman, then stole second base. I desperately wanted to watch the game, but ended up having to slam a tape into the VCR and get in the car and leave. It was an exciting series. It was high-scoring. The overmatched Phillies did not have many veteran players with World Series experience on their roster, but they gave it everything they had. 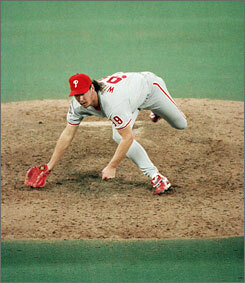 After the Jays won Game One, the Phils came back, behind Terry Mulholland with a Game-Two victory. Back in Philadelphia, the Series got nuts. The Blue Jays blasted Philly, 10-3. But to be honest, because of our hospital experience, I felt like I wasn’t completely able to immerse myself in the games. But Game Four was insane. There was rain. There was wind. There was a lot of rain. Neither starting pitcher, Todd Stottlemyre nor Tommy Greene lasted past the third inning. The Jays won the game 15-14. A World Series game. 15-14. It was as wild as baseball ever gets. Curt Schilling turned in a brilliant 2-0 performance in Game Five, enabling the Phillies to force the series back to Toronto for Joe Carter’s heroics. It’s strange to see former Phillies’ closer Mitch Williams working as an analyst for FOX in these baseball playoffs because, to me, the only thing he’ll ever be remembered for is serving up Joe’s gopher ball. Because I spent the week going back and forth to the hospital, the 1993 World Series is not one I remember in deeper detail. But it was totally worth it to visit my wife…and our beautiful, gorgeous, perfect, new baby daughter. Our first child – who’s now 17. 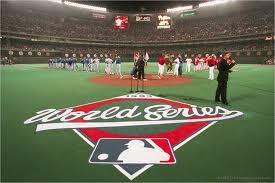 So, the 1993 World Series is one I’ll never forget…but probably for a different reason than you. Man, that Joe Carter. Bet he isn’t as cute as your daughter! In fact, my wife desperately wanted to name our daughter “Josie.” Get it? Joe C.
But, once again, I had to be the voice of reason in the family.